QUEEN OF THE ROAD was only the third pick for this new, Oak Park, IL book club. 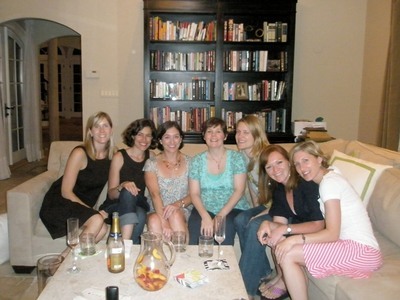 From Left to Right: Kate, Erin, Jen, Erin, Katie, Loretta, Sarah. Because this book club is made up of mainly moms (and a few teachers) the most burning question (other than where we put the cat box, which I get asked so often, I really should do a blog post on) seemed to be: What advice could I give to women who want to follow their dreams, but can't take a year off? Think about it. And, know that it doesn't have to be permanent. Dreams can change, if you want them to. So go for it! Let your imagination run wild! Then... carve out some time. Maybe your dream is to write the Great American Novel. You don't need a year off to do that. A half-hour a day, a few hours a week - whatever you can do. And if your dream really is something that requires an extended time off, let's say backpacking in the Himalayas, first: make an appointment with someone like me to medicate you out of it. (Hiking? Really??? I need a fresh pour.) Then... start reading about the experience: Travel books, memoirs, maps, history of the area. Keep the dream alive to make it more likely you'll actually do it. I think I must have answered the question fairly well, as Sarah emailed me afterwards: "The conversation was a unique experience and part of the best book club I've ever attended. All the girls agreed! We continued talking about future bus trips, summer home dreams, and family adventures late into the evening." What are some of your dreams and do you think you'll live them? If not, why? Nicely put! It always helps to have achievable dreams as well! Otherwise you are setting yourself up for disaster. Just because you have a big dream, do not forget all the little dreams along the way or you might feel a bit of regret at the end of it all! Good point about talking people out of stuff. I told my hubby after my last great idea, prefaced with "Wouldn't it be FUN to..." that the next time I get bitten by that bug, to take me firmly by the shoulders, shake me, and say, "NO! It really WOULDN'T be fun!" Things to talk/medicate me out of include: hiking the Inca trail; living in an Ashram in India for a year; and taking the Trans-Siberian express from Russia to China. Kristy - I love that about little dreams. Dina - I fear we're talkin' so many meds, I'd lose my license. This page contains a single entry from the blog posted on July 15, 2009 4:18 PM. The previous post in this blog was Newport Newcomers. The next post in this blog is Children of the Waters.